A feeling of ambivalence takes hold of me as I read the introductions on the website www.republicart.net. Republicart is an Internet platform with a large collection of essays and activities centring on the signiﬁcance of the public domain and the role of art within this domain. The ‘heavy encounter’ with constant quotations from celebrated leftist thinkers, which seem almost an obligatory opening to the introduc­tions to the theme sections, is hard for me to digest. 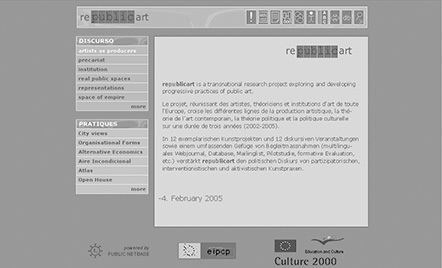 The project (which can also be read as Re: Public Art) makes its premise quite clear: ‘Our investigations focus on the concrete experiences of non-representationist practices, the constituent activities particularly in the movements against economic globalization.’ Fortunately the authors immediately go on to say that this is not about glorifying revolu­tionary movements against eco­nomic globalization, but rather about new forms in which ­critical cultural activities can organize themselves ‘in between’ the great movements of our time. Another source of unease is the continual references to the work of Michael Hardt and Antonio Negri, in particular their book Empire. A concept central to the neo-Marxist ­analysis of Empire (Marx adapt­ed to the age of ‘neo-liberal economic globalization’ – Republicart jargon) is that of the ‘multitude’. This is a transformation of the mono­lithic concept of the masses according to Marx, which is no longer applicable in the wake of countless authoritarian catastrophes. In Empire, Marx’s masses are transformed into a kind of cohesive amalgam of micro-groups and ­identities all working toward the same ultimate goal, namely the collapse of neo-liberal ­global capitalism. If one sets out to investigate how critical culture can organ­ize independently or in relative autonomy today, one might wonder whether a unifying concept like the ‘multitudes’ and Hardt’s and Negri’s Empire theory, with its strong tendencies toward historicization, are genuinely useful. The site’s manifesto quotes Ernesto Laclau and Chantal Mouffe: ‘We are experiencing a politicization that is much more radical than any we have known before...’ How so? Was there no history before 1968? I would have thought that the politicization of Russia in 1917 or of Germany in 1933, to name but two examples at ­random, were much more ­­ far-reaching. So why read on? Because this website contains a great number of brilliant essays (with and without Hardt/Negri quotations). Because it raises many fascinating questions about critical cultural activities, public space and the broader public domain. No one can deny that art and politics have entered a new arena of contention in recent years. The time when the political was negated in art is long past; political issues have in fact become a theme of contemporary art production in a very direct way. Two successive Documenta exhibitions, more or less successful, have provid­ed clear evidence of this. I fully subscribe to Republicart’s thesis that there has been an increasing politicization of public space recently. The invasion of public space by cameras and security systems, the increase in ethic conflicts in multicultural cities, the legal requirement to carry personal identiﬁcation documents – which went into effect in the Netherlands on 1 January 2005 – preventive searches, attacks on religiously identiﬁed buildings, vigilante groups, the resurgence of the trade union movements and social conflicts manifested in the streets, terrorist threats and security measures, the proliferation of commercial propaganda in urban space, along motorways, on building scaffolds, and as a tragic nadir the ritual assassination of ﬁlm­maker Theo van Gogh, have turned the street, the town square, the temple, the mead­ow and the parliament into a central stage for political drama as never before. However, what would be more useful than expressions of support for unifying theories with a limited shelf life would be to identify the many dilemmas currently facing producers of critical art in a politically polarized and charged environment. In that context, the essay on a post-emancipatory concept of emancipation, by the philosopher and founder of the Croatian political- cultural journal Arzkin, Boris Buden, in the ‘Space of Empire’ theme section, is ­fantastic. Buden analyses how complex political relationships have become in a multicultural and multivalent world. Before you know it, your protest against an unjust war turns into a demonstration alongside religious fundamentalists, or resistance against ‘neo-libs’ turns into a potlatch of hard­core conservative nationalists! What does this do to your social engagement? It makes it half-hearted; ambivalence creeps up on us. Which ­‘values’ do we actually share? It is these more speciﬁc explorations that make the website highly readable. The fact that documents can be viewed as PDF ﬁles and if necessary printed out is an­other useful aspect. Republicart is more than just a website or Internet magazine; it is a ­broader-based research project into the position of public art and culture, carried out in cooperation with a large ­number of international culture organizations. In addition to the publications, art projects are organized, as well as a series of thematic conferences – most of which have already taken place, incidentally. A project of such breadth and with such an explicitly politically charged objective should be highly appreciated. Republicart clearly takes a stand against the ‘anything goes’ mentality of the ‘happy 1990s’, the era without movements. Yet I doubt whether the reinvention of Marx’s ideology is the right answer to the social and cultural complexity that deﬁnes the current dynamics of the public domain – that enigmatic and magnetic space to which we are inevitably drawn.